Here’s how to make Guacamole 5 different ways. First, take the recipe for classic guac and kick it up a notch with these 4 creative super yummy flavor stir-ins! Try Corn and Bacon, Chipotle and Scallion, or chunky Pico de gallo. 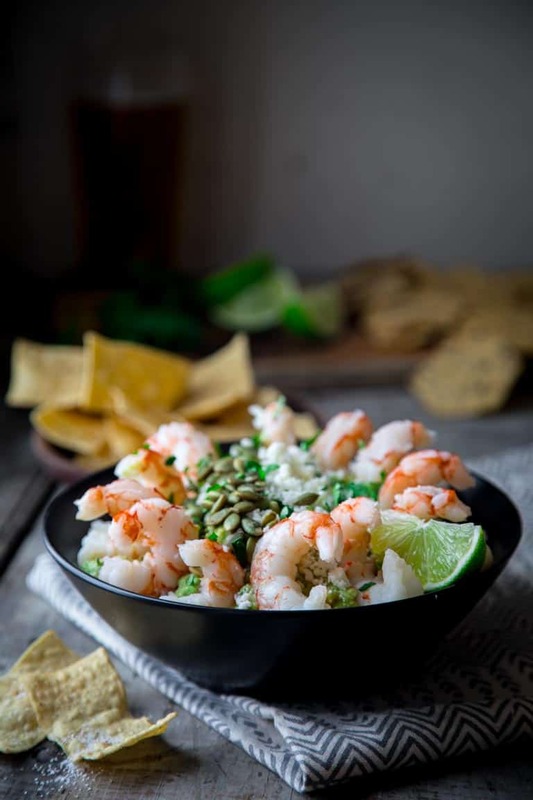 Or you can get really fancy and garnish the top of the bowl of classic guacamole with shrimp, cotija cheese and pepitas! Or for the classic lovers, just stick with classic guac- you can’t really go wrong with that either! So grab your avocados- let’s get mashing! I’ve already walked you through how to make authentic classic guacamole, with 6 tips for the best classic guacamole. So if you haven’t reviewed that, now is a great time for a refresher. Basically- use salt and lime and only a little garlic. Brighten it up with some fresh cilantro, and only a smidge of picante sauce. That’s it. From there, think of your bowl of guac like a blank canvas! That’s when you get CREATIVE with super flavorful stir-ins! 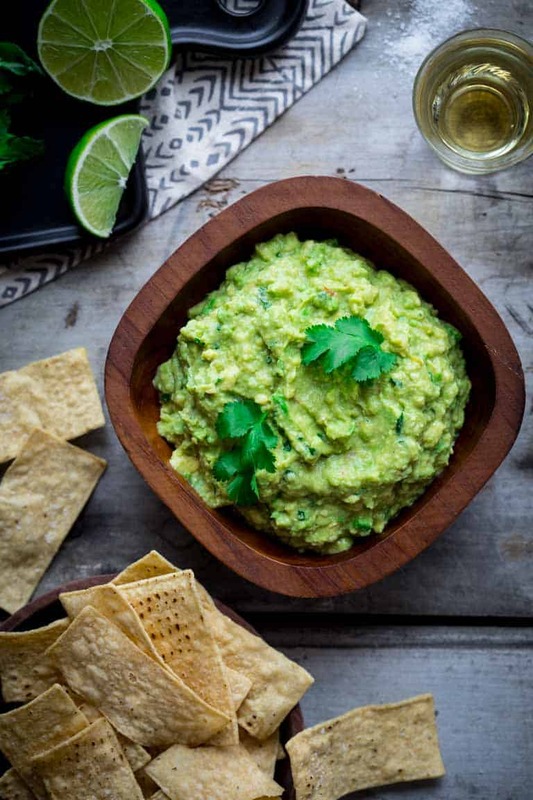 Try making all 5 versions, stock up on chips and dippers and then throw a guac party! I’ve spelled out four combinations to try adding into the authentic guac recipe. And they’re gonna knock your socks right off. I am not sure which one I like the best, they’re all so good! This is the master recipe where it all begins. If you’re a purist, then this is 100% the best and most fool-proof way to go when it comes to authenic guac. The keys to success are to make sure you use enough lime and salt, and watch out not to go overboard with raw garlic. 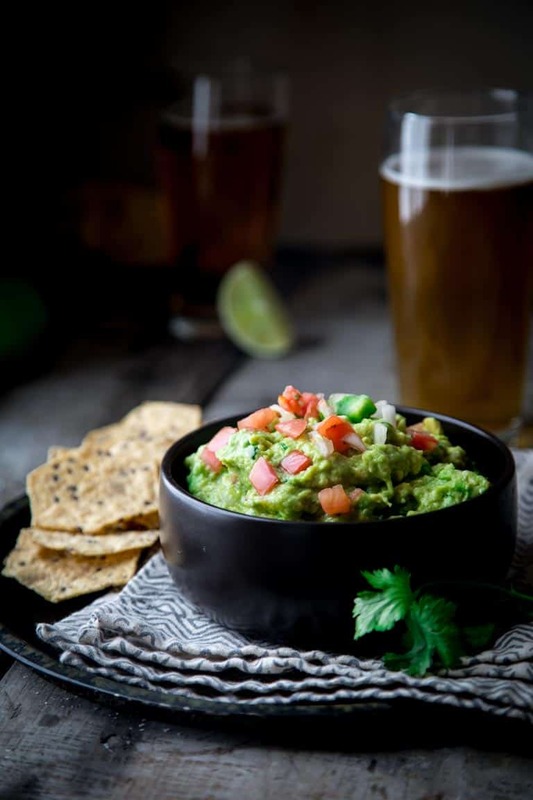 Read more about how to make the best classic guacamole here. Next up, add in a big scoop of pico de gallo. It adds chunky interest, but won’t send the pickier eaters at the party running for cover. I used 3/4 cup for 1 batch of the classic guac. You can use you own home-made pico de gallo or you can buy some from the store. No stress! Next, I took one finely chopped canned chipotle in adobo and stirred that in with 3 sliced scallions. My hubbie and I loved the heat and the smokiness, plus an added kick of scallion to make it really flavorful. You guys, this is so good. Gahhh. Love this one so much! Steam one ear of corn, cut the kernels off, and add that to the classic guac. (It’s about 3/4 cup kernels- so if you want to take a short-cut use 3/4 cup thawed frozen corn.) Plus 3 strips cooked bacon and 1/2 teaspoon smoked paprika. I mean, c’mon folks, what is not to love about this combo!!?? Nothing. It’s so good! Ok, it’s not really shrimp cocktail at all, but it kinda looks like that, when you decorate a bowl of guac with shroimp all around. Add on cotija cheese, pepitas and a little more cilantro for extra crunch and flavor. And then dunk the shrimp right into the guac instead of a chip. OR load you chip up with all of the above including the shrimp! Heck yeah! What combo would you like to try first? Have you ever had shrimp and guacamole? What is your favorite way to jazz up guacamole? Take a batch of classic guacamole and add in these four other flavor combinations. Serve all five for a festive guacamole party! 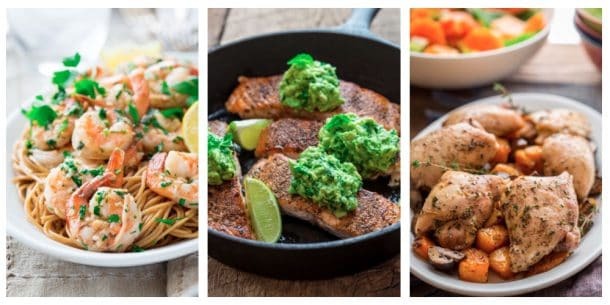 Chunky pico de gallo, bacon and corn, scallion and chipotle or festive guacamole shrimp cocktail. Make batch of classic guacamole. Serve as is or try the following variations. For Chunky Pico de Gallo: Stir pico de gallo into classic guacamole and serve. For Chipotle and Scallion: Stir scallions and chipotle into classic guacamole and serve. 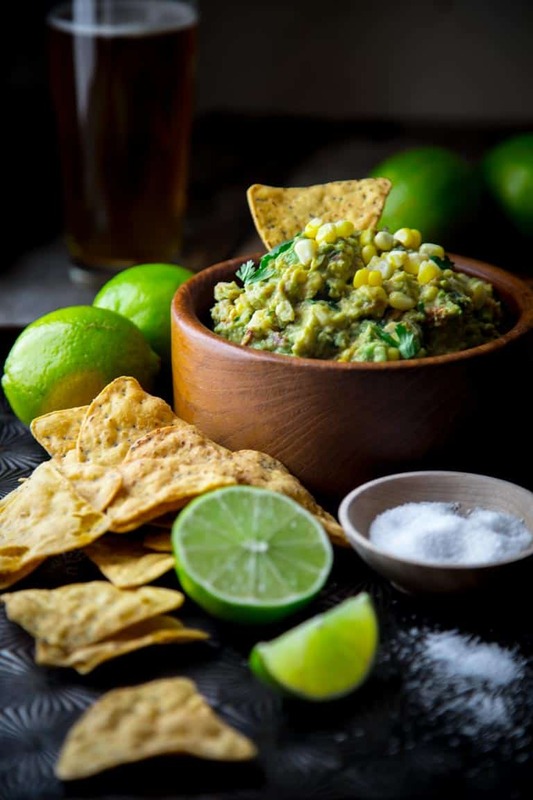 For Smoky Bacon and Corn: Stir bacon, corn and paprika into classic guacamole and serve. Mound classic guacamole into a medium wide serving bowl. 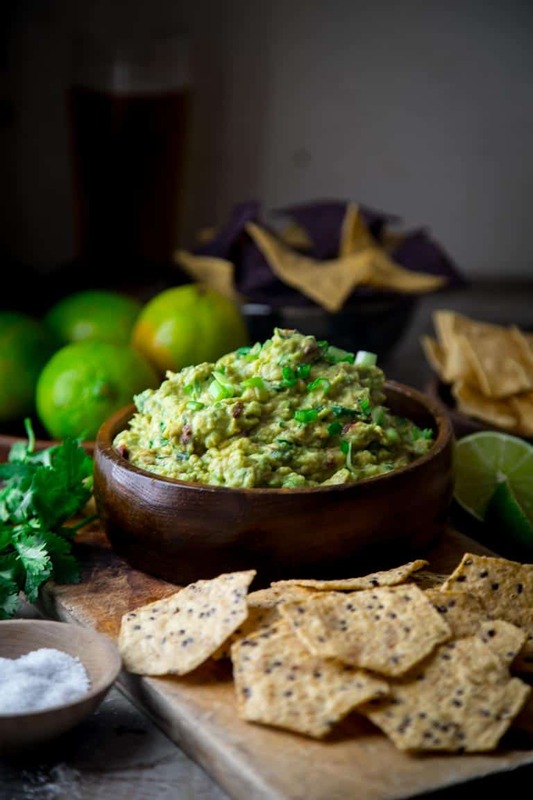 Arrange cotija (or feta) and pepitas over the guacamole. nutrition values are for classic variation only. 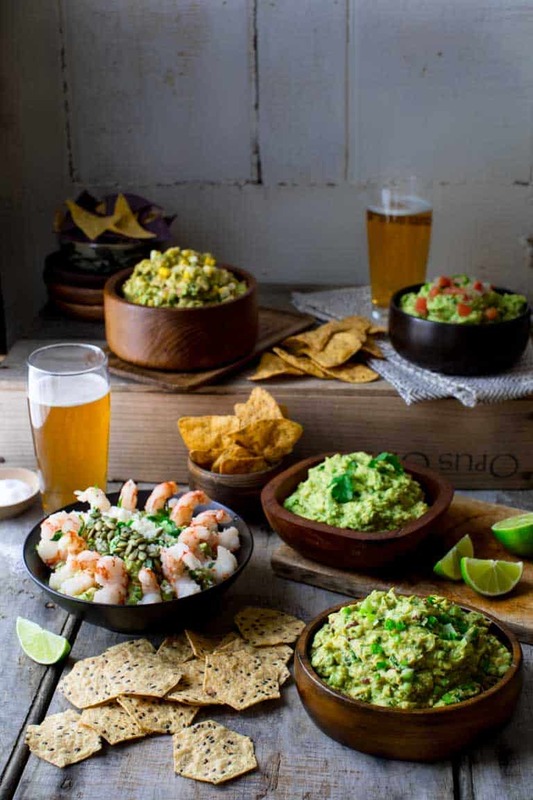 Every single one of these guacamole recipes looks amazing! Perfect for game day! Thank you so much Emily. That is so nice of you to say so. Have a great day! I love hearing that you have it once a week. Hope you enjoy these variations. Thanks for coming by Joyce. I don’t know what to do first, although the chipotle scallion sounds amazing! I agree chipotles are pretty irresistible. I love heat plus smoke so that one was a fave for my husband and I. The ultimate resource for guacamole! 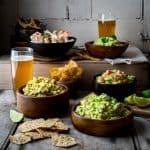 I love all your variations and I often take guacamole to parties so will use some of these ideas for sure! Thanks so much for saying so Karen. Have a great day. I am such a creature of habit that I almost always make our standard classic guacamole, hardly varying at all. These are such great ideas to break out of the rut! Classic guac is pretty awesome as is, so I can understand why you’d stick with that. Yum Yum!! I combined two and tweaked a little 🙂 made my guac, added some bacon, green onions, and prawns (shrimp for every bite!). Thanks so much for posting these!! That sounds fabulous Jennine. 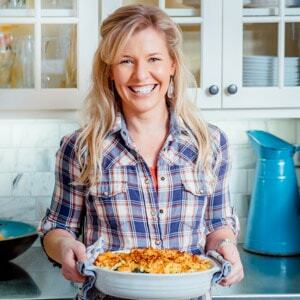 Thank you so much for coming back to review the recipe! I appreciate it!